Not sure what to call this – it’s a sort of Spanish/Moroccan fusion thing, using up bits and pieces that were in the fridge and cupboard. Put the chorizo bits and the chopped onion in a large frying pan and heat gently until the onions are soft. Stir in the spices and let them heat through for a bit. 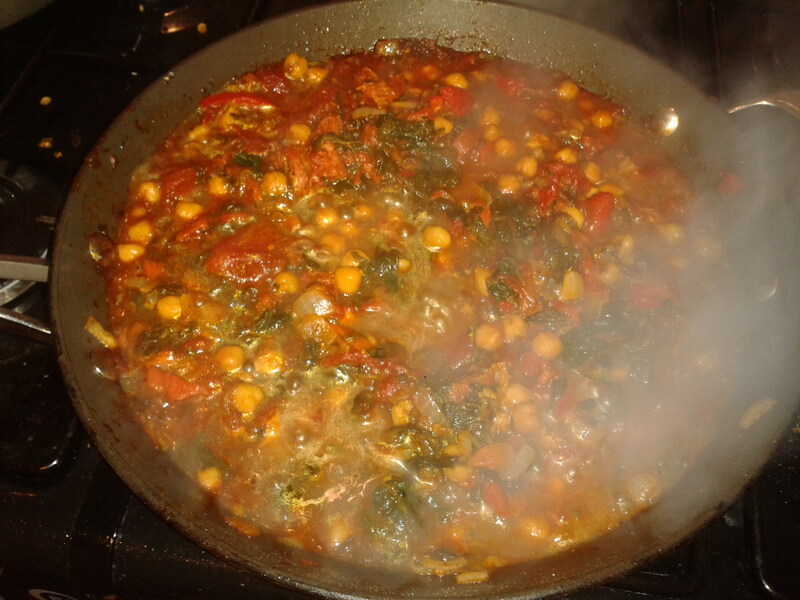 Then add the chopped magic peppers, the tomatoes and the chickpeas, with the hot stock. Add in the frozen spinach and let it all bubble together for about 20 minutes. Add salt and pepper to taste (shouldn’t need any salt because of the stock and the chorizo). Cook the couscous according to the packet (usually adding a double quantity of boiling water and leaving it to stand for 5 minutes) and serve the Moorish thing on top of the couscous. Morgan’s speciality. This mixture makes about 18 and lasts about as many minutes after they’ve cooled down enough to eat. Preheat the oven to 160 degrees C or gas mark 3. Put 3-4 cm water into a saucepan and bring it to a simmer over a medium heat. Break up the chocolate, cut up the butter and put both in a mixing bowl. Put it over the pan of gently simmering water and turn the heat off. Stir occasionally until melted together and smooth. Alternatively, put the broken up chocolate and butter into a microwave-proof bowl and microwave on full power for 10 seconds, take out and stir, then put back in for another 10 seconds, etc. until it’s all melted. Only 10 seconds at a time, mind, or you could end up with burnt chocolate and nobody wants that. Meanwhile, break the 3 eggs into another bowl, and pour in the sugar. Whisk the sugar and eggs together until the mixture is smooth and creamy. Add the chocolate mixture to the egg mixture using a rubber spatula to get all the chocolate out of the bowl. Mix thoroughly together. Sift in the flour and cocoa powder and mix thoroughly. Stir in the nuts if you’re using them. Line a baking tin about 20x30cm with a piece of foil or baking paper and pour in the mixture, using a spatula to get the last scrapes out. Smooth the top of the mixture in the tin. Put the tin on a shelf in the middle of the oven and bake for 20-25 minutes. Don’t cook them for too long – better a bit squidgy than too solid. Take the tin out of the oven and stand it on a wire rack. 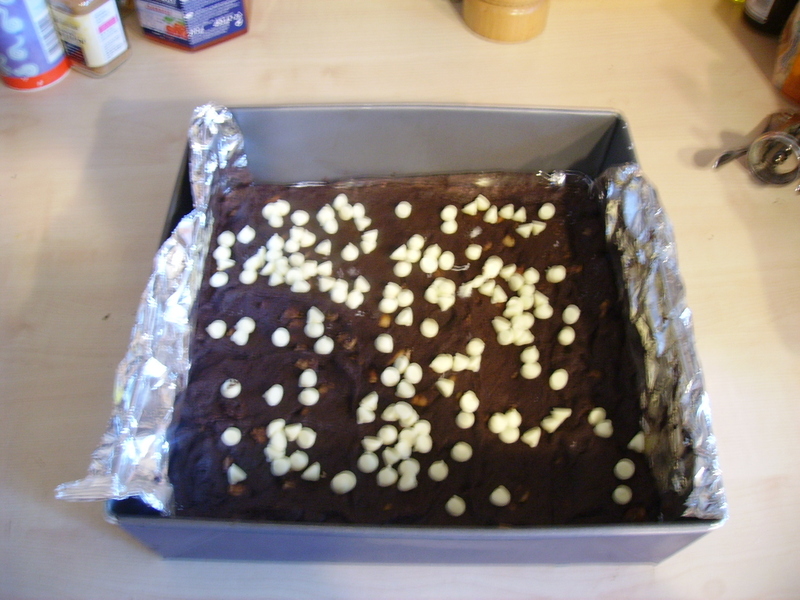 Sprinkle the white chocolate chips over the top while the brownies are still hot, to give them a chance to melt a bit. Leave until cool enough to cut into squares. Nuts to Lent! I’m giving up giving up things. Even people who profess not to like marzipan (me included) seem to like this. Sieve the flour, sugar, spices and a pinch of salt into a large bowl. Rub the cold butter into the flour mix until the mixture resembles fine breadcrumbs. Try not to get it too warm or the butter will melt and the texture will not be quite as good. Add the milk. Knead the dough into a smooth ball, again trying not to handle it too much or get it too warm. Wrap the dough in cling film or a plastic bag, and place it in the refrigerator for 1 hour (or even overnight). Whisk the eggs with 1 tablespoon water in a separate bowl. Grate the marzipan over another bowl and pour in half of the egg. Mash the egg with a fork through the marzipan. Preheat the oven to 175 ˚ C. Cover a baking sheet with parchment paper. Sprinkle the counter and rolling pin with a little flour. Divide the dough into two equal pieces. Roll each piece of dough to a piece of about 15 x 30 cm. Lay one piece on the baking sheet, then spread the marzipan mixture evenly over it, leaving a border of dough around the edge. Place the second sheet of dough on top and press the edges together to seal in the marzipan mixture. Brush the top of the dough with the rest of the egg. Press the flaked or whole almonds into the dough as decoration. Put in the heated oven and bake for 40-45 minutes. When baked, leave the cake to cool on the baking sheet before cutting. Rather than use a baking sheet you could also use a round or square cake tin, which avoids having to roll out equal sized pieces as you can just press the dough into the bottom of the tin.